To some, how to feed a toddler at snack time is seemingly a no-brainer - it's called the infamous Goldfish cracker. Enter #easywin #toddlerlife here. Even as a pediatric dietitian, I am all for such easy wins in motherhood and at meal and snack times too. My daughter inhales these little fishy-shaped cheese crackers just like every other two year old I know. I wouldn't be practicing what I preach though if I touted Goldfish crackers as the gold standard of healthy toddler snacks. 1. Fill nutritional gaps first. While kids often love processed snack foods, as parents we need to see snacks as an opportunity to offer nutrient-dense foods first. Evaluate what your foods your child may not be eating enough of at other times during the day, like fruits, vegetables, dairy, healthy fats, or whole grains. Young children have small stomachs that fill quickly, so limit “filler foods” at snack time as much as possible to better optimize each bite. 2. Pair carbohydrates, protein, and/or fat. While milk and cookies is a tasty combo on occasion, aim to pair snack foods that both fuel and fill kids on a more consistent basis. Offering a well-rounded snack will satiate children until the next meal while encouraging them to eat a more balanced diet with fruits, vegetables, whole grains, and healthy sources of protein and fat. Establishing this as a norm also equips kids to think of snack options beyond one singular snack food staple (ie. the infamous Goldfish crackers). 3. Offer water in place of other beverages. It is recommended that young children drink no more than 4 oz of fruit juice and ~16 oz of milk per day. When children consume too much sugar-sweetened and/or calorie-dense beverages, it can displace their intake of other nutritious foods (especially when beverages are given between meals). For this reason, encourage water intake through the day. Spread milk intake throughout the day according to the times your child seems to request it the most (ie. upon waking, before nap, at night, etc.). Reserve juice intake for special occasions or when child needs added sources for hydration. Toddler’s tummies are small and need to eat more frequently than older kids and adults. Aim to schedule small snacks between meals, so that child does not graze constantly nor become overly hungry. Adjust the type and amount of snack foods offered based on how long it will be until a meal is served, giving heartier snacks to hold them over when it will be 2-3 hours until another meal. This discourages unplanned snacking and/or endless nibbling as much as possible. 5. Keep snack time safe. While the reality is that kids won’t always be at a table or in a high chair for snack time, accommodations should be made to offer safe food options in safe eating environments. Avoid foods that are known choking risks especially when supervision may be limited (note: almonds were included on the free download, so feed with caution to kids under the age of three). Also, encourage children to enjoy their snack while sitting (versus stand/walk/run) for safety and to encourage their focus on the activity at hand (snacking). Too many distractions can promote grazing as well, rather than teaching kids to enjoy the food offered and listen to their bodies for signs of fullness. Need some new toddler snack ideas? Whether you need some non-perishable snack ideas for a few final road trips or camp outs still left this summer, or you are getting stocked up on on back to school no-prep-required after school snack ideas, these healthy snacking tips are all ones you can begin to use to make the most out of snack time. 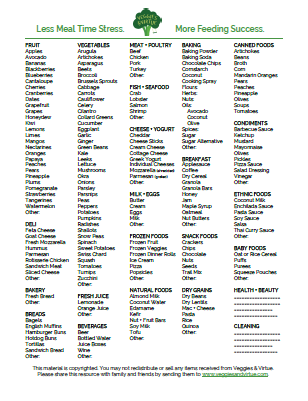 Be sure to download the free shopping list too for ideas on healthy options to offer when putting these snacking tips into practice. Don't want to forget this post? Use the "Pin" button (on the top left corner of the image at the top) to a "Healthy Kids Snacks" board. Then you can reference these tips and come back for the grocery list any time you need!